Farming is the core of our concept for Harvest. We plan to transform a conventional farming operation into a certified organic farm, providing residents and the local community with healthy, fresh, farm-to-table food. In addition to receiving a share of the bounty, Harvest residents can also consult with our Master Farmer for gardening and farming expertise. Plans for the Central Farm include a vineyard, lavender fields, a truffle orchard, and a variety of seasonal fruits and vegetables. We're currently putting together a team of farming experts to implement our vision for the Central Farm at Harvest. The efforts are led by Tony Kleese, founder of Eastern Carolina Organics and an activist who has worked with the USDA to implement consistent organic labeling practices. Bryan "Busha" Green has helped incubate organic farming operations around the world, from the mountains of North Carolina to the Philippines. Duane Verner, a future homeowner at Harvest, has been growing truffles in North Carolina since 2004. Duane is in charge of developing truffle farming operations at Harvest, in coordination with Betty and Franklin Garland, who operate Garland Gourmet Mushrooms & Truffles of Hillsbourough, NC. 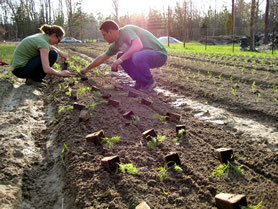 Organic farmers plant fennel on their farm in NC. Photo courtesy of Eastern Carolina Organics.